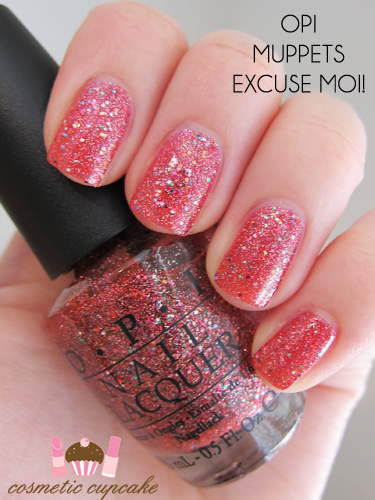 Today I have some swatches for you from the highly anticipated OPI Muppets collection! 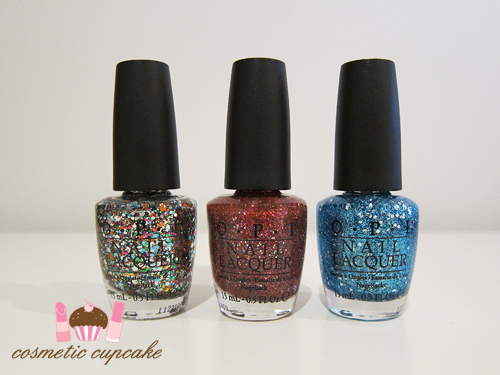 This is OPI's holiday collection for 2011 and this year they've given us yet another fabulous collection. This year they've collaborated with The Muppets and the upcoming The Muppets movie with 12 amazing polishes - and 6 of them are GLITTERS!! I've been waiting for The Muppets collection to come out for sooooo long and I couldn't wait to swatch them! Today I have Rainbow Connection, Excuse Moi! and Gone Gonzo! for you. "The dazzling Muppets lacquer collection is not something to miss, featuring 6 bright sequined glittery lacquers, four metallic shades and 2 rich shades of burgundy red. The partnership between The Muppets and OPI, both icon brands, is in their ability to be fun, creative, quirky and passionate. The collection is an epic spray of colour, glitter and fantasy, in true Muppet style, OPI’s The Muppet Collection will not disappoint." Rainbow Connection is a rainbow glitter suspended in a clear base. 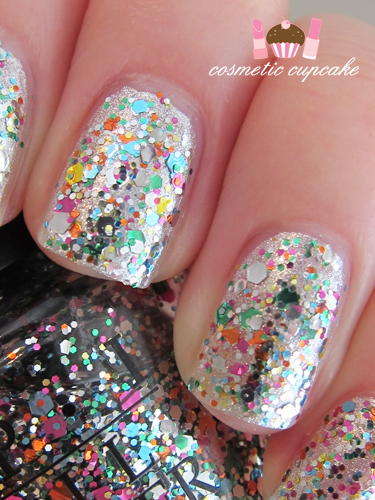 It contains multicoloured hex and small round glitters and is a GLITTER PARTY IN A BOTTLE! This was the glitter I was most hoping to own as I LOVE glitters like this. 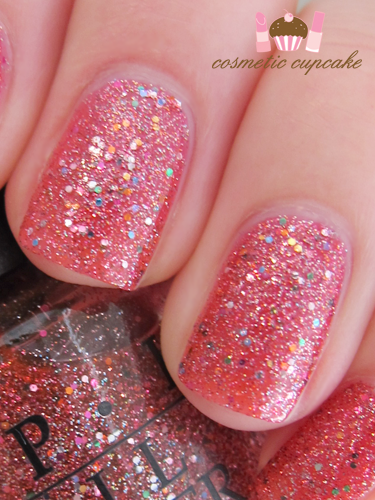 The formula is a little thick so the glitter doesn't glide onto the nail easily. I use what I call the "splat method" to apply where I basically get the brush and "splat" the glitters on haha. I use this method to apply other hex glitters too like the Milani Jewel Fx glitters. It's somewhat difficult to wear Rainbow Connection alone as it would become quite thick so I'd suggest layering it over a base colour. If you'd like to see Rainbow Connection alone have a look at my post here. I've layered a few coats here over a silver foil and I think it looks amazing. I'm wearing it as my NOTD right now because I couldn't bear to take it off! Excuse Moi! is a very pretty warm pink glitter. It contains medium round rainbow glitter with silver microglitter suspended in a warm pink base. It is so pretty and quite unusual. It is nearly completely opaque in 1 coat which I'm amazed at! 2 coats is pictured. Gone Gonzo! 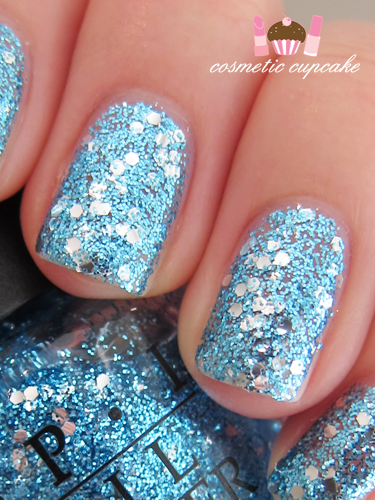 is a sparkly aqua glitter. It contains aqua glitter with silver hex glitters suspended in a clear base. It applies quite sheer so a few coats is needed to reach opacity. The formula is a little on the thick side so I'd recommend waiting a good few minutes before applying more coats or it will clump. My pictures don't do this polish justice - in real life Gone Gonzo just dazzles!! 3 coats is pictured. 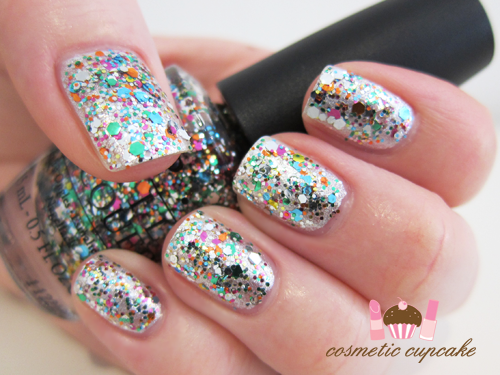 Overall: These glitters are just amazing and absolutely perfect for the upcoming party season! I know I'll be rocking at least one of these glitters on NYE this year! Yes glitters are a pain to remove but oh so worth it in my book for the sparkle and fun that comes from wearing them. I DESPERATELY need the rest of the OPI Muppets collection. YOU need them. Your sister needs them. Your mum needs them too. Enough said. Details: The limited edition OPI Muppets collection is available now at selected salons and David Jones store nationally for $19.95. Hello, who has been the winner of the drawing? I don't see it for any side!!! Excuse Moi! is such a cute shade! I love the effect of the nail polishes! I love Gone Gonzo! Although I cannot stand the pain of removing glitter nail polishes, I may make an exception for Gone Gonzo though, it's so pretty! Wow! Rainbow Connection is SO gorgeous. It's probably a hassle to remove all that glitter, however. I think that time is worth it! I really like Excuse Moi! You're right, it's definitely a bit unusual among all of the glitter polishes that are so trendy right now. Hmmm okay...I know I said on my blog that the muppets collection didn't blow me away...that was before I saw these swatches!!! The first one over the silver foil looks dazzling!!! I must try this ;) And gone Gonzo is just stunning! oh.. woooooooooow the collection is amazing!!! I want Excuse moi even if it's a little hard to apply. Love how you've worn it here and would probably do the same. The effect is insanely colorful and funky. I like it. When I first saw these polishes I thought I might need to get Excuse Moi, but now I have to have it! And I totally agree with you about removing glitter. I hate it but it makes me happy looking at my nails! I love Rainbow Connection!! <3 Plus I LOVE how you layer it over a silver foil! Its such a fun look that I'm gonna try for upcoming xmas parties keke~ thanks for the inspiration Chelle!! From looking at other swatches of Excus Moi! and Gone Gonzo! they didn't really interest me. But your pics make these two glitters look so exciting and sparkly - seriously I think I NEED them! hahaha!! I love glitter polishes but hate taking them off. Any suggestions on removing the glitter? I love the Gone gonzo the most! The Excuse Moi looks great too ^____^ The rainbow one looks amazing aswell but it looks similar to normal multi-coloured glitter polishes imo~ Haha, Have fun taking the nail polish off~ I'm going to try your tin foil method soon! You're right about glitters being a pain to remove! But they are so pretty that it doesn't matter! All of these are AMAZING!